-This is the company that makes the W-15 Pickup truck, series hybrid PHEV with the range extending outsourced BMW gas motor. -They also make a BEV step van and a mini (or smaller) cargo van. -They make fleet management software that makes it a snap to keep track of a fleet of vehicles, from GPS location to when maintenance is due. -As if that’s not enough they also make drones for commercial purposes, a parcel delivery one and a passenger mini helicopter type recently rolled out. -As Workhorse Group expands its footprint, eyes will be paying closer attention to see how their upcoming pickup truck will fit into the constantly changing light duty full sized DOT Class 2 pickup truck segment in the US market. -Flight ceiling of 4000 feet. At a recent rollout adjacent to New York City’s Madison Square Park near the historic landmark the Flatiron Building, Workhorse Group CEO Steve Burns introduced the crowd to a helicopter vehicle not quite seen before. Laid out in a display that detour-overlapped crisscrossing Broadway and Fifth Avenue in the Flatiron District, was this thing that looked like a helicopter and a rugged looking pickup that looked like it came from the movie franchise “Transformers.” He first had to disappoint the crowd that free rides were not forthcoming as the flying vehicle is in the process of getting FAA air worthiness approval as they do have testing certification. Now, you would think that Workhorse is either getting way over their heads, or jumping all over the place (sounds like another electric vehicle company doesn’t it? But ah, graciously, not in this case) by building trucks and vans and a regular looking cargo delivery drone and software, to now building outright aircraft, but there is a rhyme to this particular reason. One of the rhymes is that eventually it appears that they will either spin off the drone making arm into either a division or separate company from the truck making. Let’s do the drone first, then the truck then the van. Essentially the guts of both the pickup and the helicopter are the same surprisingly, except in the truck’s case “the mains” or primary propulsion power source is from the batteries and the gas motor acts like a backup range extender. In the helicopter it’s the opposite: “the mains” or propulsion is provided by a gas motor generator to give the aircraft about an hour’s worth of flying time with backup provided by the batteries. If the copter were set up like the truck flight time would be severely cut short, like only 20 minutes, that’s why they do it that way. The copter is power supplanted by plain old electric generated by the tiny gas motor, and the batteries act as emergency backup in case of a failure. The gas electric generator and electric system allows for a design that skips the helicopter designation, and makes it a VTOL passenger drone. With a simplistic design, less weight, and less energy use, a tail rotor and large single central swirling blade flying above the craft are not needed, saving 20% energy. Instead, four arms, two of which have counter rotating propellers, keep the craft airworthy. To turn or twist around copter style, all you do is speed up one set of arms and slow down the other, and you can do “the Twist” in the sky. You can lose one arm and the thing can still fly. Workhorse’s secret sauce for this drone is its motherboard of complex sophisticated design done in Tesla-like minimalist engineering fashion. Its hallmarks are redundancy and the ability to compensate 1000 times per second when for example, one side of the craft has unequal weight like an empty seat or full payload. And if all else fails, well, it has something that most aircraft don’t that people who don’t like flying will like: it has a giant “tactical parachute” in case of Mayday emergency failure. Because of weight concerns and efficiencies, minimalism gains importance in this craft. In the spirit of Model 3, less is more in the interior, with two seats, a joystick, and a tablet for instrumentation, not even rudimentary gauges, so that you can have 400 lbs of payload, make a choice: one person or cargo but not really both, at least substantially. No talk of when this craft will be available for market, but they’re in testing phase which means short of a sudden unforeseen design flaw, it should be ready to go soon. To get on the waitlist, you do need to put down $1,000 USD deposit. 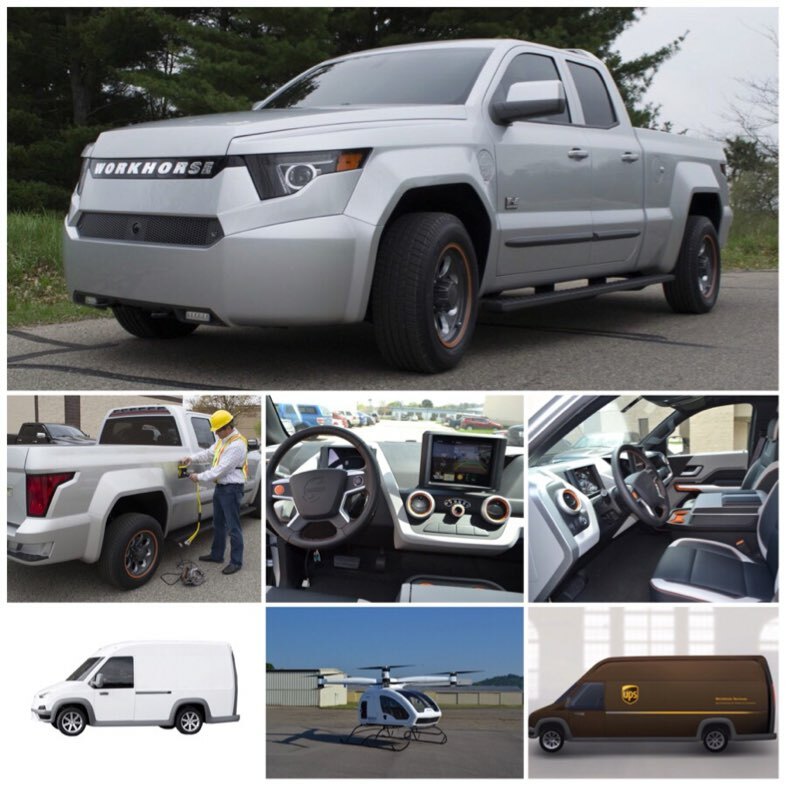 There is no doubt that although they are a truck making company, if Workhorse were ever to have a holo and flagship vehicle, whether they realize it or not, so far it seems that W-15 is picking up those two mantles to become their halo flagship as the Queen of Electric Pickups. The full sized pickup truck segment in the US so happens to be the best selling segment of all other vehicles right now, ask Ford. And if she does a better job at electric pickup, even though she’s technically a PHEV which is supposed to be a transition vehicle, some of you forget, than say, the other electric vehicle company with their proposed pickup plans, W-15 may be poised to keep the title. We’ll have to see. In the meantime she’ll have plenty of time to not only iron out the rough edges and stomp out the bugs before production, she’ll also have time to improve after two or so model years before we even see the first Model Pickup in a store. So there was CEO Burns at his Flatiron rollout touting his science project Surefly, while W-15, the bread and butter, sat on the side. It was as if the crowd was anticipating an air show before the Queen’s Speech, as the Queen sat waiting for her turn. Thank goodness W-15 also has wow factor to amaze a crowd about its uniqueness as well. There are presently no other electric pickup trucks sold on the American market. And regardless of its engineering, whether you like the way it looks or not, for a truck it does look at the least kinda unique if not different. This is what happens when here’s only been one hybrid pickup ever offered by manufacturer (GM) in this segment that it was cancelled, and there’s no kind of electric pickup being offered. It makes the next offering different if not controversial. The legacy car makers have no one to blame but themselves for this situation, that it seems Workhorse and soon maybe Tesla, will force their hand. Ford says they’re finally getting around to it. But on another hand you can understand why everyone is where they are in the pickup market with the legacies without an electric truck at present. It’s one thing to electrify a car, its another thing to electrify a truck. Technology has improved but those battery packs are still heavy. That’ll cut into towing and payload, even storage. Car makers have already had issues with regulators over the years as to where to put gas tanks in pickups to have lawsuits and recalls about exploding gas tanks. A battery pack on a pickup will be more exposed in a truck than it would be on a car that might make this situation worse unless there’s a good work-around. Trucks, especially 4x4 and AWD, wade through water. How are you going to protect a battery tray and e-motor from water damage? Finally there’s the truck consumers themselves: diehards, loyal, conservative, resistant to change, like their trucks the way they are. How are car makers going to change their habits? You begin to understand why the legacies put off electric truck making this long. Remember demand moves markets, not the other way around. So what you begin to see here is that Workhorse in many ways, is paving the way not only for the legacies, but also for Tesla, by putting their vehicle to market first. It’s a lot of pressure to be the first standard by which everything else will be judged. But they’re cleverly doing it their way. Like most things Workhorse, part of the secret sauce to its build is carbon fiber to keep the weight down for other needed things. It also has a Panasonic battery pack. So it can haul around 2,500 lbs of cargo and tow 6,000 lbs to be taken seriously as a pickup truck in the DOT Class 2 category of full sized pickup truck. With 460 horses and a typically electrical torquey 0-60 in 5.5 seconds, she ain’t no slouch. After somewhere between 80 and 100 miles of juice, a tank of gas with its outsourced BMW gas engine used the i3 to extend the range will give you 310 miles. There’s one sure thing W-15 has that the Ford F-150 will never have that makes it a compelling buy: a lower total vehicle operational cost. With an unstable oil market that’s bound to have another gas crisis, this makes W-15 a sure winner with its 28 e-mpg compared to 15 mpg with an average full sized pickup. In its minimalist keep it simple theme, Workhorse is going to sell the truck on a fleet wide basis only, for now, and the larger the fleet the better, which will help keep its cost down to around $52,000 USD/unit. It comes in only one color, and options are limited, reminding me of the Ford Model T. You can tell thought was put into the design of this vehicle, from its interior design, the dash layout, and the outside ports for power tools and power supply. Like Tesla, it too has a frunk that doubles as a crumple zone and storage (no crash testing yet). One of the ways they were able to survive as a startup was to keep its labor costs low. With less than 150 employees on payroll, they swear they can eventually make about 30 units a day. This too requires a $1,000 deposit USD per unit to be waitlisted. It looks like they may ramp up production in a few months. I wish them well. Something tells me this is going to be a hotcake. The key issue is persuading the to transfer to the retail consumer market. The last vehicle we’ll look at is Workhorse’s N-GEN mobility cargo van. This is the van they sealed a deal with UPS last year to provide 50 units to test and if all goes well, may incorporate these into their sole purposed fleet of alternative fuel driven vehicles. With an option of either c. 5,000 or 7,000 lbs payload and a 100 mile all BEV range with an option of range extenders for each model, Workhorse is making a highly configurable vehicle for many commercial purposes. But some of you folks are starting to get to know me. There’s one configuration that Workhorse hasn’t considered that they should make these platforms available for another commercial industry they may not have considered: the camper van motor home industry, as this would make for a great platform for an EV camper van. All they need to do is add more battery pack to extend the range, and with that long floor that sits not too far off the ground, I’m sure if there’s a will there’s a way. It’s compact shape, with the tall 105” ceiling, low floor, I think this would make a great camper vehicle to turn over to a camper outfitter to convert. Perfect for an EV camper. What do you think? You can tell Workhorse is a whole different can of worms than Tesla. Electric vehicle manufacturers both are, but that’s it. They’ve made mistakes too along the way no doubt, but the difference is what kind of shape they came through on the other side of the lesson. Workhorse started as a fleet conversion company to see as they went along that some vehicles were not made to be converted to electric as readily as others. Their lesson learned was that if you want an electric fleet the right way perhaps the best way is to start from scratch. Thus, the Workhorse we see and know today. They have been steady, methodical, sure footed, and maybe a bit lucky to be at the right place and the right time at the right price to acquire an OEM brand just ready for repurposing. Workhorse seems to know the difference between taking a chance and assuming a risk, a value that Tesla seems at times to grapple with, with some successes and failures of their own. But regardless, we do know this: here are two electric vehicle startups that are still in business, expanding their product lines, and their market reach by diversifying. Both had to alter their business models as they went along, both have their set of challenges to deal with, both conduct business very differently, both leaderships have very very different styles of management, but they are still here, and both are American companies. For that I applaud both of them to wish them well, and root for both.